The last two days I've been at DjangoCon Europe. This time it was in Warsaw and to be different, it was in a tent, in a field. And it was awesome. There was a big circus tent, in a grassy field. Surrounding the tent were beach chairs and hammocks or you could just lie in the grass and listen to the talks. There was free beer, food and ice cream. Seriously, forget stuffy hotels where you don't see the light of day, this is the way to go. That's probably the best conference venue I've ever seen. What impressed me as well was the level of organization from the team. When I arrived in my hotel I found a personalised note reminding me when my talk was, with some vodka, chocolates, a rather dodgy looking hangover cure... and a prepaid data SIM card for my phone. What a nice touch. Of course in this environment something could have gone wrong. It could have rained. But what happened instead was that the airport did some construction on a road and two weeks before the conference changed the flightplan at the airport so that planes took off right over the tent. But that became a game, spawned Twitter accounts and life moved on. I know how much work a conference takes, this team really raised the bar. Great work - thanks Ola, Ola, Kuba, Tomek and Jarek. 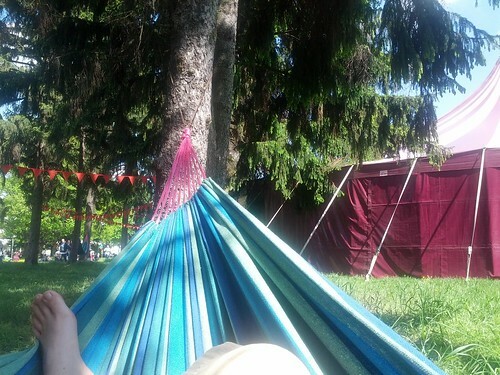 ..listening to talks in style at DjangoCon EU.